Looking to escape from NYC during the long Presidents Day weekend in February? You’re certainly not alone, which means you’ll have to pound the digital pavement for the best deals on lodging and transportation. Presidents Day is actually a great time to leave New York City, with winter airfares being significantly more of a bargain than the peak tourist months of May through October. Of course, a getaway anywhere near the tri-state area means you’ll most likely be dealing with unpredictable – and most likely frigid – winter weather. You’ll want to opt for cozy B&Bs with warm lounging areas over austere modern hotels or cheap rentals without amenities like fireplaces and warm blankets. Montauk in winter can be delightful. For recommendations on b&bs out at the tip of Long Island try the Longisland.com website, which does some halfway decent updates on the area. Atlantic City is absolutely dirt cheap during Presidents Day. You can get away there if you’re willing to brave the utter ugliness and unattractiveness of it all. The Catskills are great options in any season. 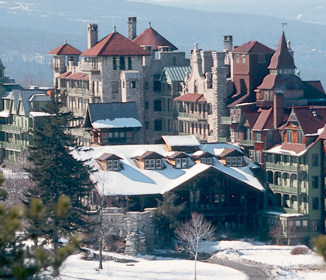 For winter highlights in those areas you can head to the official Catskills tourism site. For the Hudson Valley and Rhinebeck, you can explore The Art of Building. If you can afford it, grab a last minute package to Puerto Rico or one of the Virgin Islands, or even Mexico’s Mayan Riviera. Though the prices are a little higher thanks to to tropical locale, you’ll still avoid the worst of Spring break madness, while sustaining yourself for the rest of the winter with a much-needed injection of sun, sand, surf, and a three-day weekend away from the office.